The weather is great today as it was yesterday. 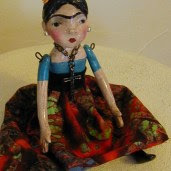 I am working hard on making my ebay dolls. I am happy all is well today. Everyone is in their right and perfect place. All is calm and all is bright. I've been trying to do different dolls lately. I really want to put some of them in the gallery at the art center but the prices just don't work for me. So I will just plod along and do my own thing. Still looking for a mold maker so I can make my dolls more efficiently. I haven't done much with my art journal for some time now and I miss it. Maybe I'll do that tonight. I have attempted to clean my studio. I have tossed one garbage bucket of things out. I hope to the same this week. Wish me luck. Why am I such a pack rat????? Above is another painting I have on ebay. I just love the mermaid! The mold thing sounds like a great idea and as for letting go of a garbage can full, good for you. The payer article was right on. Thank you!